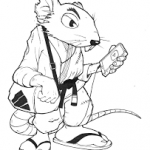 BJJ Mat Rat - Page 5 of 8 - Roll. If you’re anything like me (and approximately 100% of other jiu jitsu practitioners) you’re always on the lookout for details to improve your game. 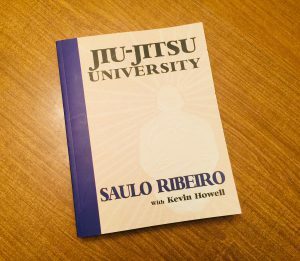 YouTube is a great place to go, but I also like to do a deep dive through reading, and Jiu Jitsu University by Saulo Ribeiro offers a lot to learn. Saulo Ribeiro has a black belt in Jiu Jitsu, Judo and has fought (and won) in MMA. He has won the World Jiu Jitsu Championship five times, and competed in Metamoris 4, where his match against Rodrigo Medeiros ended in a draw. He is co-owner (with his brother Xande Ribeiro) and instructor at The University of Jiu Jitsu which boasts over 50 affiliates world-wide. 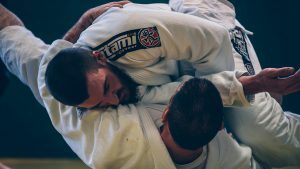 Ribeiro’s book “Jiu Jitsu University” divides techniques by belt rank. 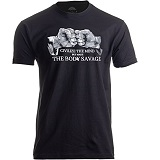 He spends some time in the introduction describing what he believes to be the goal of each of the belts in jiu jitsu. I found this insight to be very helpful, understanding what a seasoned black belt thinks the focus of a particular belt should be serves to construct a road map in my mind of what to work on in my particular rank. Well, I made it through 6 days of eating (mostly) only meat. I had one cheat about 3 days in, I ate some oatmeal with honey and banana in the afternoon because I was going to have a long session of jiu jitsu training later that evening, and wanted to make sure I had energy to roll. I had another cheat last night, when my family wanted to go out for pizza. Man, I love pizza. That pizza was delicious. The best pizza of my life. So here I am on day 7, reflecting on the past weeks experiment. One thing I learned a few days in is that I grossly under prepared for the amount of food I was going to need for the week. The meat I bought on Sunday was gone by Tuesday. So back to the store I went, several times. Part of this week-long trial run on the carnivore diet was to learn how to get by day to day in regards to meal prep. I’ve learned that the way I am currently approaching meal prep is EXPENSIVE. I’ve blown my grocery budget for the week, I’m on day 7, and I’m out of meat again. Clearly I need to learn some cost cutting moves if this is to be sustainable over the long haul. 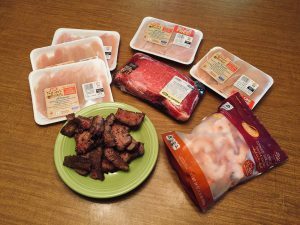 I’ve joined a Facebook carnivore group, and have asked questions about how to budget for a carnivore diet, and the general consensus is to eat more ground beef (less steak if money is a concern, after all ground beef is ground steak), and to do some shopping at Costco or Sam’s Club, where meat can be bought in bulk. 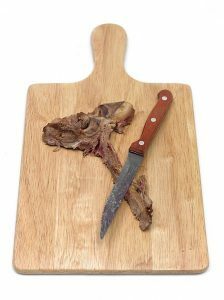 As for now I’m going to have take a break from a pure carnivore diet, simply because I don’t want to go spend any more money on meat, I’ll just eat what the rest of my family is eating for the remainder of the week. 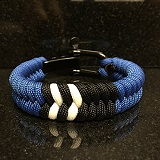 I recently attended an open mat where all the blue belts had really great open guards. It was extremely frustrating (in the best possible way) to try to pass their guard. The usual pressure passing that I do just didn’t seem to work. 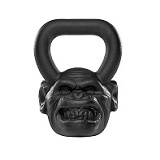 They were able to handle the pressure well with their legs, and if I was able to beat their legs, then as I swung around to try to get to side control their far leg somehow made it’s way between me and their torso and I was stuck in open guard again. I talked to a few people after the open mat to see what their strategy was, and they all said they had played a similar guard, essentially using a knee shield and variations to control me. Being only a blue belt myself I hadn’t really seen the knee shield used to such great effect, but as I understood it the school they belonged to focused heavily on guard all through the white belt curriculum. That was an “ah-ha” moment for me. I had also been focusing on guard heavily for the past year, but to see how effective a good guard game could be so early in a jiujiteiro’s development really solidified my thought that a well developed guard can lead to a more confident offensive game. I’m traveling this week on vacation, down in Florida visiting family and friends. 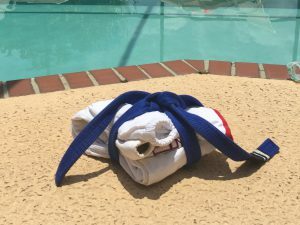 Though the week will be spent mostly poolside with a drink in hand, my daughter lives here and trains Jiu Jitsu locally, so I will be spending some time on the mats, working off my gluttony and catching up with her while bonding in the gentle art. I didn’t want to fly here and be dependent on the school I was visiting to loan me a Gi for training. I wanted to bring my own, it fits better anyways. I tend to travel light, so I wasn’t too concerned with being able to fit my Gi into a travel bag, but I still researched the best way to fold a Gi. My usual method of balling up the pants and jacket and shoving it into a bag tends to take up a lot of space. 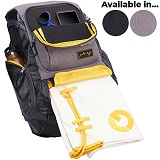 I wanted to be able to get it to the smallest size possible so I wouldn’t run out of any room in my duffel bag. Chris Haueter is a dynamic Jiu Jitsu fighter, instructor, referee and illustrative artist. He is one of the first Americans to earn a Black Belt in Brazilian Jiu Jitsu, cementing his place among the BJJ Dirty Dozen under the tutelage of the great Rigan Machado. Haueter has been an avid competitor for many years, where his aggressive style can be seen on YouTube, and has also worked as a referee for Metamoris. 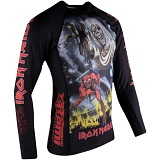 In addition to Jiu Jitsu he has practiced karate, wrestling, Muay Thai, JKD (under Dan Inosanto) and Boxing. He is accredited with coining the term “Combat Base” in reference to the seated, one knee up position used when in someone’s guard, and his Californian school is also called “Combat Base“. Wim Hof is somewhat of a medical phenomenon. 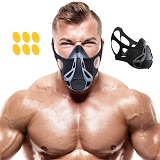 He is an extreme athlete from the Netherlands who holds 26 world records and is best known for his ability to perform well in extreme cold temperatures. He holds the record for the longest ice bath, he has climbed Mount Everest and Mount Kilimanjaro wearing nothing other than shorts and shoes, completed a full marathon above the arctic circle in Finland (again, in shorts), and boasts countless other physical feats in extreme weather conditions. 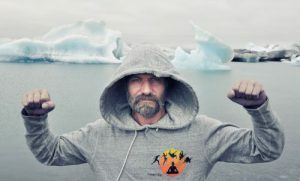 Wim Hof travels the world giving seminars on his unique method of training for these challenges. Known as the “Wim Hof Method“, it is a combination of cold exposure and breathing exercises aimed at building brown adipose tissue, reducing fat and inflammation, fortifying the immune system and raising oxygen levels for more energy and reduced stress. 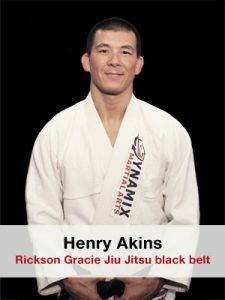 Henry Akins is a Jiu Jitsu black belt under Rickson Gracie. 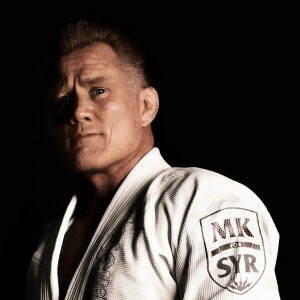 He has the distinct honor of being the 3rd American to receive a black belt under Rickson. While training at the Rickson Gracie Academy he worked as a secretary, instructor and even as a training partner for Gracie to help him prepare for his fights in Japan. 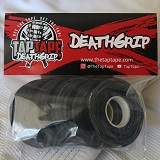 He earned his black belt in 2004 and was the main instructor at Rickson’s place until a back injury forced him to stop. In 2010 he founded Dynamix Martial Arts with Antoni Hardonk. Henry maintains an active schedule not only teaching at Dynamix, but also travels the world teaching seminars, and has created an online site of paid video courses at HiddenJiuJitsu.com. 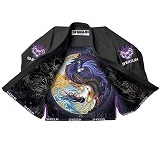 A sub section of the Hidden Jiu Jitsu site houses a members only area, the Mind Blown Jiu Jitsu club, which features exclusive content, and gives members access to a Facebook Group where they have direct access to ask Henry questions, and discuss technique with other members of the group. Being a member myself I can attest to the availability of Henry to the members, and of his deep knowledge of jiu jitsu. 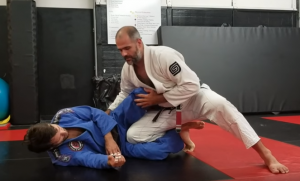 He has stated that he wants his legacy to be to make Rickson’s style of effective jiu jitsu accessible to everyone, and the content that he is publishing is serving him well to this end.